Let’s face it; for the majority of grooms, it’s not the wedding day they’re most looking forward to - that’s the bride’s day. What the soon to be shackled husband gets, all he really gets, is the stag party. It is the same for grooms on their bachelor’s night in Cape Town. Your life is about to end. Sure, some call it a beginning. But we know the truth – certain things will never be the same and all that lies between the your freedom and a life of ‘yes dear’ is your bachelor’s evening. That’s why at the famed Mavericks Gentlemen’s club, they believe in giving you the bachelor party send-off of a life time; with the good vibes alongside class and elegance that we’ve come to expect from the prestigious gentlemen's club. 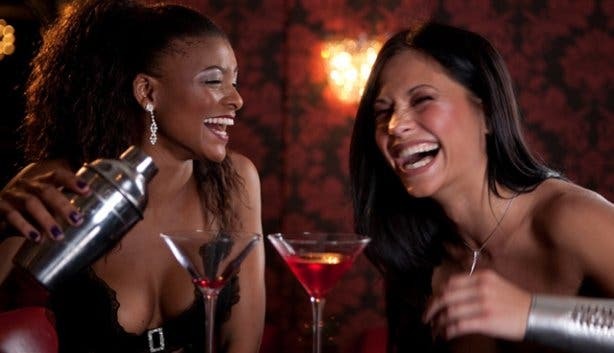 Let us give you 100 great tips for your bachelor party. On the list of things to do on a perfect bachelor’s day and evening, rule number one is: there shall be a stripper. And if you’re looking for a quality bachelor’s eve you might just want to go way out and have 100. Offering only the highest class of [fe]male entertainment, and with one hundred dancers available - Mavericks guarantees your night will be an unforgettable one. Of course it wouldn’t be a proper stag night if the bachelor wasn’t the centre of attention, and at Mavericks attention is certainly not lacking. The good thing is that it has all the ingredients for a proper bachelor’s – a few bars, plenty of girls, VIP floors and private lap dance booths as well as bird cages; in style – and not too slick so you don’t feel like a party anymore. The exotic, stunning dancers ensure the bachelor is at least for this one stag night, the most important person in the house (not say all members of the party won’t get ample attention). The four distinctive areas all allow maximum enjoyment. The ground level offers the most active atmosphere - plush leather chairs, couches and the main fully-stocked bar close by, (and a view of two of the three stages) you’re free to mingle with the dancers. Especially suited is The Platinum VIP Lounge; the epitome of opulence and resplendent luxury. For the exclusive bachelor’s evening. Complete with its’ own private fully-stocked bar, the third “cage” stage and private lap dance booths. Seductive entertainment, luxurious decor, and undivided attention. The best bachelor's party in South Africa - in style and still enough vibe for a party too. While all of the 3 distinctive and unique levels in the club offer everything a bachelor party requires and then some, The Library lends an even more ideally suited welcoming. This exclusive private room offers the port and cigar ambiance that really every bachelor party should have – and everyone should experience at least once. A stocked humidor ensures top class refinery for your smoking pleasure. Comfortably accommodating eight people, the elegant Library boasts the best in luxury and privacy. The walls lined with books in dark wood shelves, there is an old-school charm that one generally struggles to emulate; but Mavericks pulls off perfectly. Scattered with sofas, it is elegant and comfortable to the utmost, and the private attention only adds to the night’s flavour. Here boys can be boys in an absolutely relaxed, every- whim- catered for atmosphere. Of course, that’s really Maverick’s maxim, providing a venue where men can have a night that will be remembered, talked about, and fondly recalled for a lifetime. And of course send offs are thirsty work; luckily Mavericks has a bar that stocks everything you could ask for, specialising in the finer tastes – premium whiskies, armanacs and cognacs - and the world’s best champagne. Make it a eating out experience too, or use it just to stay out that little bite later at night – the elegant clubs extensive menu caters for all and sundry that the palate could possibly desire, and after all the night is about satiating desire. The kitchen is open till 2am so there is time. Make sure the last night of your free life is spent in the best way possible. Best friends, the best venue, in the best company, all coming together to make the best night you could imagine. Basic entrance to the stripclub is R100; Entrance to the VIP part is an extra R200 PP. Bookings available in advance ensure maximum advantage is taken of all that the club has on offer. Dance prices at Mavericks are R200 for two songs table dance, R250 for a lap dance, and R750 for a VIP dance to make it perfect. The Library is R1000 entry. Corporate membership: R25 000 a year, entitles card-holder +25 guests to unlimited access to all VIP areas. To stay in the loop on all things Cape Town, subscribe to our free newsletter and connect with us on Facebook and Twitter.